Memorizing scripture has been part of my daily quiet time for years, but I have always struggled with retaining those scriptures long term. For those of you who know my brain is the size of a pea I’m sure that doesn’t surprise you :). I’ve had people tell me that you have to go back and review the scriptures you’ve memorized, but that always seemed so daunting and quite overwhelming. A friend of mine shared a GREAT scripture memory method that I’ve been doing for several months now that I LOVE and it works!!! For the last several months I’ve just had this written down on a sticky note in my bible (so don’t think you have to have a nice organized colorful card like mine – I’ve been using a sticky note for quite some time) and have been going back through old scriptures I’d memorized and adding some new ones. It’s a really easy method so I hope I don’t complicate it or make it sound hard or confusing. As you can see on the card at the top I have what’s labeled my “daily” scripture. Let me share with you what I do with that daily scripture before I explain the review part of this method. On the first day of my new verse(s) I read it out loud 10 times. If I have more than one verse in that chunk of scripture I just work on one verse at a time in the chunk – sometimes I even break-up the verse if it’s really long. So after I read it out loud 10 times I cover it up and try to say it out loud 10 times with out looking at it – of course you’ll most likely have to cheat a few times and look at it but that’s part of the process. After I’ve read it 10 times and said it 10 times without looking at it I’m done for the day – it’s that easy. The next day I try to say it 10 times without looking at it. I do this for a couple of days until I have it pretty good and then I move on to the next verse of the chunk of scripture and read it 10 times and say it 10 times. Each day you say out loud without looking the part you have completely memorized before you go on to your new part. Once you’re completely done with that chunk or single verse and you know you know it well, you move it down to reviewing it three times a week. If you’re using a sticky note just erase it from your “daily” slot and move it under your three times a week slot. So once I have 1 Cor. 1:18-31 memorized I’ll move it down to the section marked “M W F” so I can review it three times a week. Once I have a new chunk of scripture to go there I move the “M W F” verse to two times a week “T H” (that stands for Tuesday and Thursday) or “Sat/Sun”. Then you move those verses to reviewing them one day a week and then to three times a month and so on. It may sound like a lot but it really only takes me a few minutes each morning. You will be surprised how quick it is. So let me give you an example of what I worked on this morning. I worked on my daily scripture (I Cor 1:18-31), then I reviewed my scripture under “T H” since it is Thursday (Proverbs 10:19), and then I reviewed my scripture under “Thursday” (Romans 1:18-35), and lastly if I had something under the 19th for the month (which I don’t at the moment) I would have reviewed that. I have been amazed at how well this method works. I encourage you to try it – or at least some scripture memory method. It’s one of the most important things we can do in the day – hide His Word in our hearts. We live in a day that our Bibles are at our finger tips, but I don’t think it will always be like that in our country. However, our Bible can easily be at our finger tips but never make it into our hearts where it needs to be. Good post, A friend and I have been memorizing the book of Ephesians using a similar method. Thanks Jason! That’s awesome! The similar method you mentioned is probably the original method a friend told me about – I just modified it to fit me better. Are you using note cards? You should know, that I will want to make the chart. I am one of those people that will spend more time getting ready to do something than it takes to actually do the method. So, how did you make your chart:-)? For the lettering I just used a stamp kit from Wal-mart and to make the parts that the scriptures go on I just cut slits on the large card and slip the pieces of scripture paper through them. If that doesn’t make sense let me know and I’ll send you a picture of the back of the card – I think you’ll get it if you see the back. I made the slits so I could move the scriptures around as a learn them. I’m glad this is working for you 🙂 I need to do this also, because memorizing is hard for me, too! It’s a really great method – you should try it out. Memorizing is really hard for me too – but it’s SO worth the hard work! I would like to see a picture of the back of your chart. Thank you for this! I’m a little late reading this blog….but God’s word never gets old. I will work more in memorizing it and follow what you said. I too am a Christian artist…and paint Plein Air landscapes mostly. But feel a desire in my heart to go deeper with the Lord in my artwork. You have inspired me to combine my scripture memory verses with meditation on them and asking God to reveal something to illustrate or give a pastel or watercolor image to relate to it! I’m especially impressed with your painting of the little girl drinking out of a cup and the scripture that went with it! I’m happy to have found you and your wonderful artwork online here, and will share with you what God enables me to do for Him with my artwork…Would you please pray for me, for Gods inspiration! 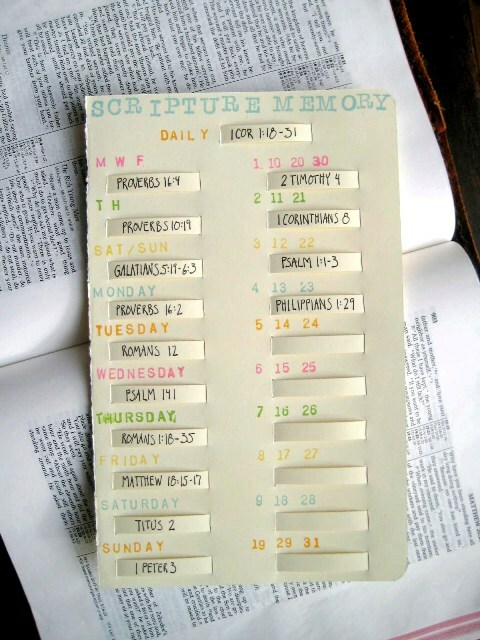 Please give detailed directions and pictures of how you made your scripture memory card. This seems like a great way to memorize. Thank you for sharing.